Johnson&Johnson 1-Day ACUVUE® Moist for Astigmatism Contact Lenses (30 Pack) - A single use, daily disposable lens that corrects your astigmatism. Great for people with a busy lifestyle. 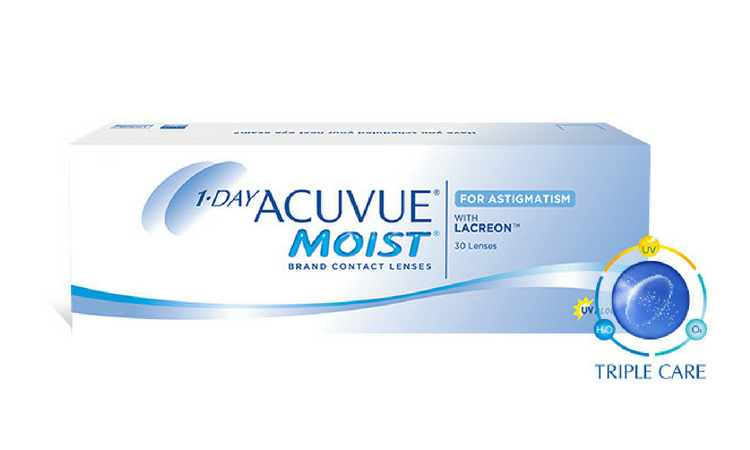 Along with the convenience of no solutions and no lens cases, Acuvue Moist for Astigmatism has an innovative BLINK STABILIZED™ lens design and the exceptional comfort of LACREON® Technology to form a lens like no other. Their unique Accelerated Stabilisation Design technology helps position the lens quickly and keeps it in the right place, no matter how active your lifestyle might be. LACREON® Technology permanently locks moisture in the contact lenses, making them so comfortable you won't feel them on your eyes. Acuvue Moist for Astigmatism gives consistently clear and comfortable vision from the moment you put them in, to the moment you take them out at the end of the day. They also carry a high UV rating blocking out at least 82% of the UV-A radiation and 97% of the UV-B radiation from the sun.